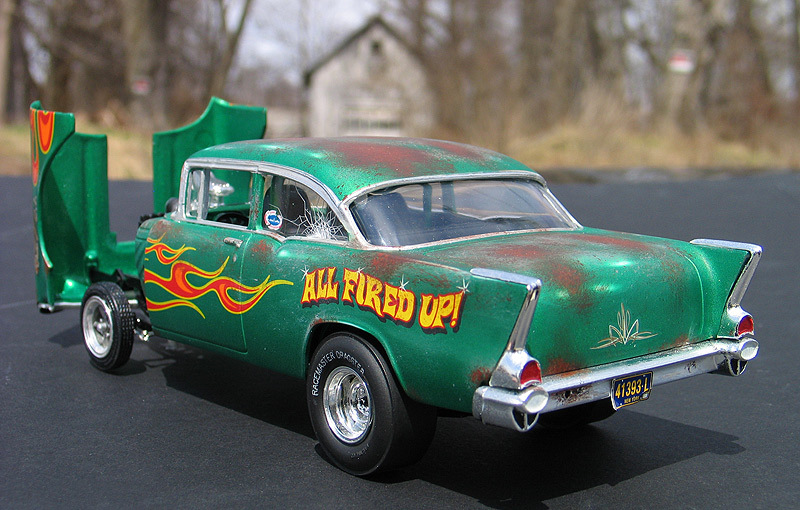 One of the hottest trends in hot rodding is locating a "barn find" car, keeping it's original patina, getting it running again and then hitting the streets. 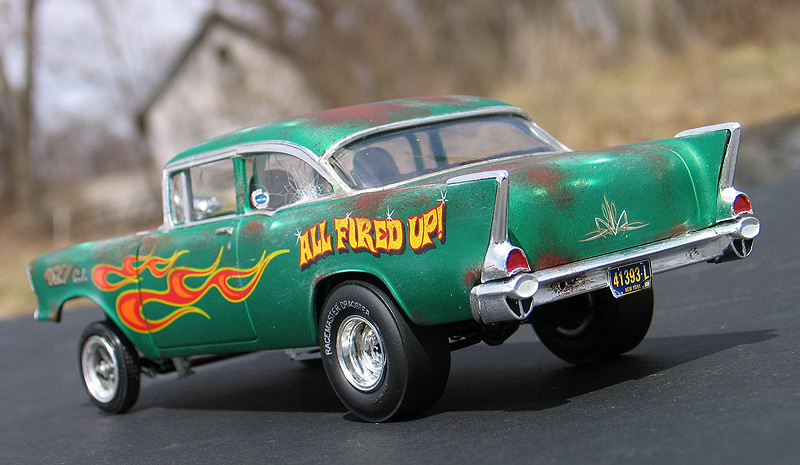 Lot's of old '60s style hot rods and drag strip refugees are finding new lives roaming modern car shows across America. 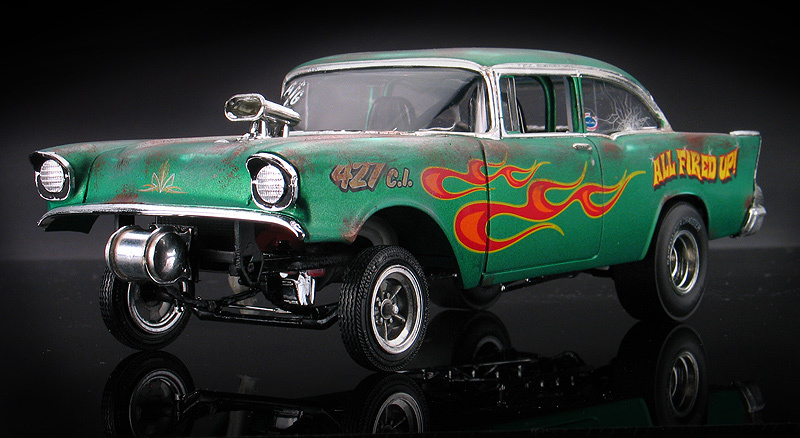 I wanted to get in the action and build one too and that was the inspiration for my rusty, crusty 1/25th scale '57 Chevy barn fresh gasser. 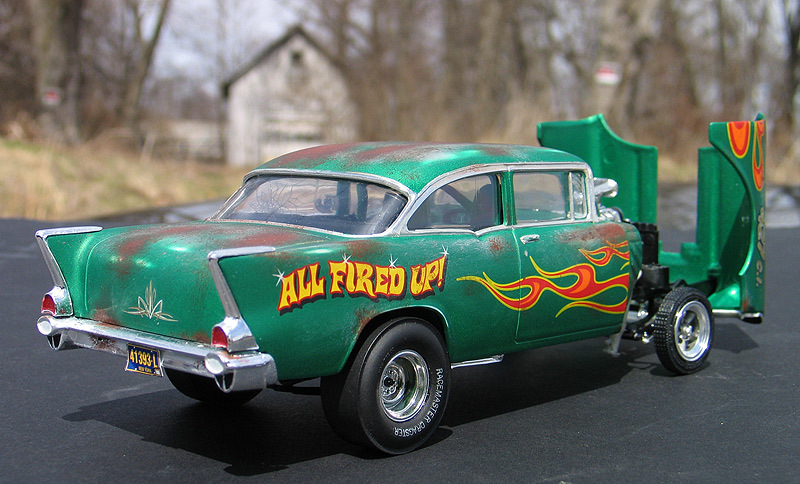 The other reasons I built this '57 Chevy Gasser were; because in all of my thirty plus years of model car building I've never built a 1957 Chevorlet and I figured it was time to add one of these iconic cars to my collection. Secondly, I had recently designed a new line of decals for Model King and I was looking for a project to use them on. 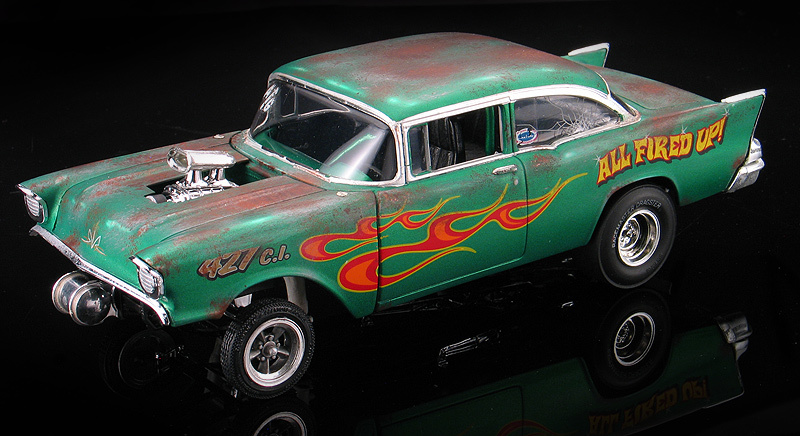 I wanted my Bel-Air to look like a car that was raced back on the '60's and then sat neglected outside for a couple decades. I didn't want it to look totally battered, just forgotten about for a while then found and put back on the street. If I was building a real car like this I would give it fresh running gear and a new interior but keep the weathered exterior. So, that's how I built my model. 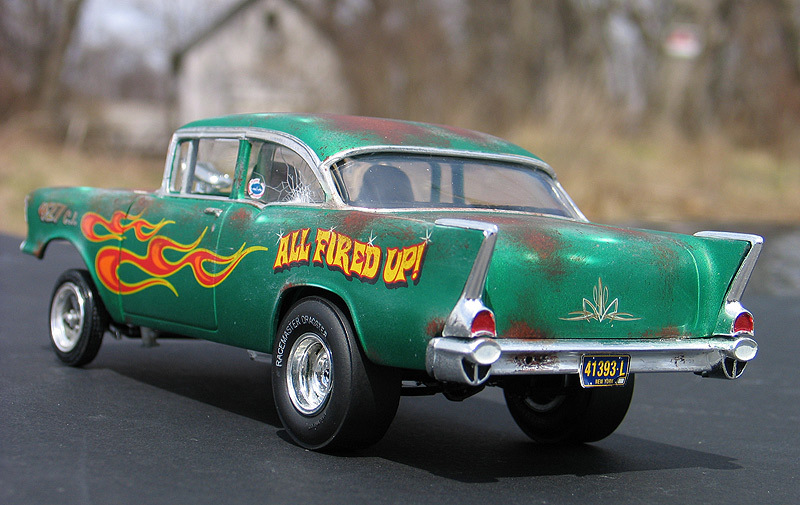 My model was built using the '70s era Amt/Ertl MPC '57 Chevy Spirit of America kit. This kit was last re-issued under the Model King label a few years ago. 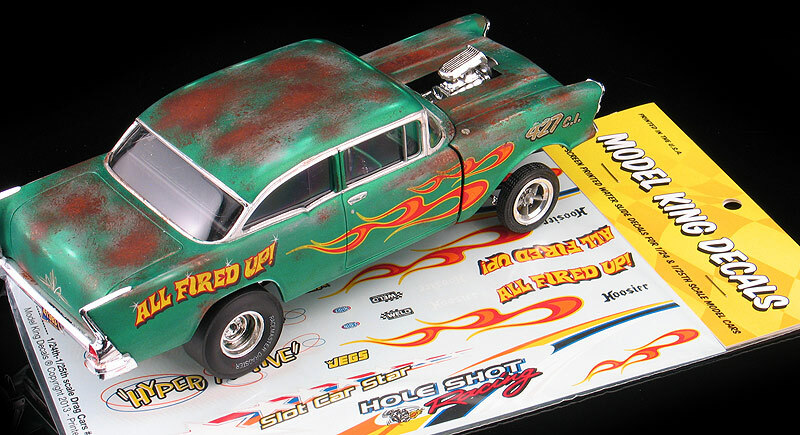 The kit features a 2-door post sedan Bel-Air body with raduised wheel wells and a flip-nose front end. 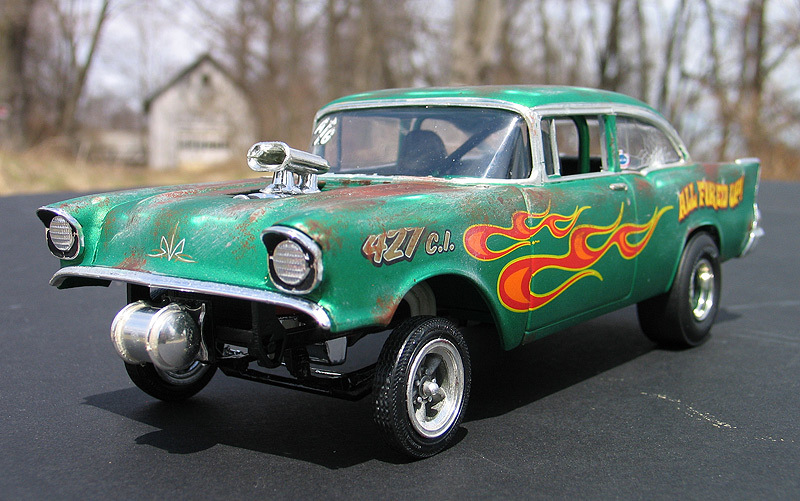 The MPC kit can't be built stock but is a perfect starting point for a vintage gasser build. I didn't stray too far from an out-of-the box build, but I did make a few changes. The MPC kit comes with Bel-Air side trim, but since I wanted to use the flame decals and "All FIRED UP" logo I'd designed on the sides of the car, I needed a blank canvas. I carefully removed all the side trim and sanded the sides flat. Also, I deleted the gun sights from the Chevy's hood and filled and smoothed the hood bullets for a custom look. 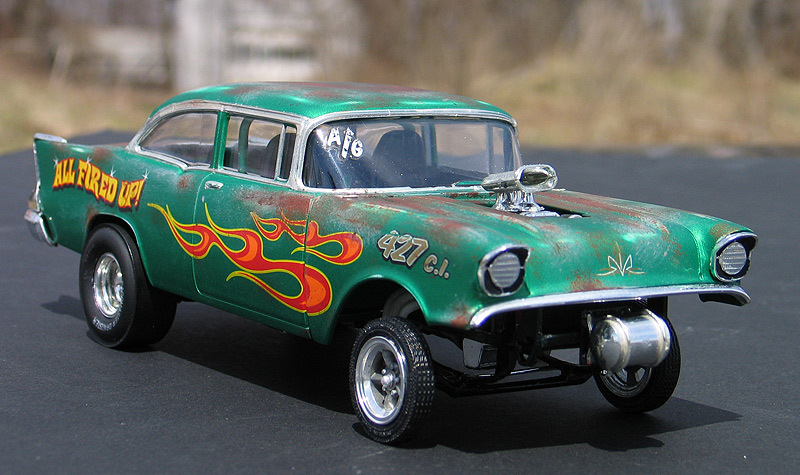 I painted the body with Testors Metallic Green One Coat lacquer. after the decals were applied I then clear coated the body with gloss urethane. Then the top surfaces were shot with a flat clear and various colors of primer and rust were dry brushed on the top surfaces to look like the Chevy had been sitting outside exposed to the sun. The rear bumper was also treated to some rust holes. Other patina'd details include a shattered quarter window and a bent license plate. Somewhere back in the '90's Amt/Ertl re-leased modified the tooling for this kit and replaced the wheels and some of the original engine's speed parts. First, I added blocks to the front suspensions to get it back up in the air. 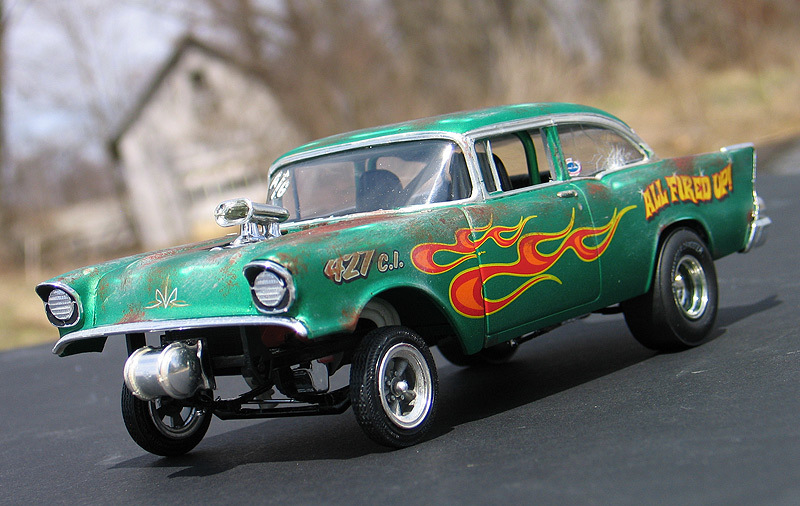 Next, since I was going for a vintage look for my gasser, I dove into my parts box and swapped the kit's 90's parts for some real vintage parts. 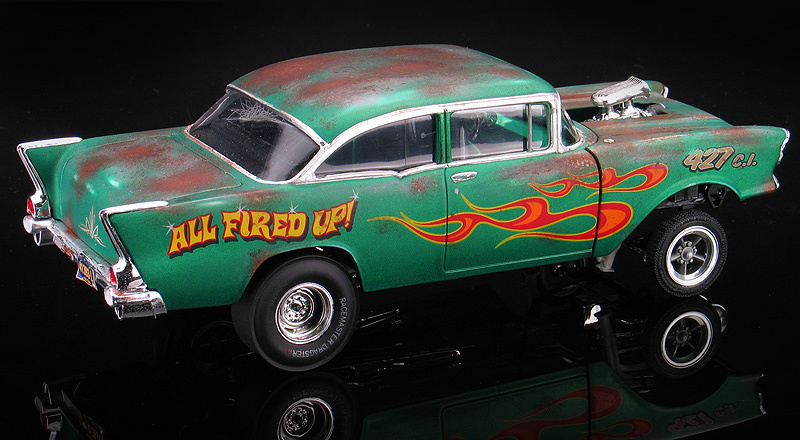 The Torq-Thrust front wheels and tires came from an MPC '69 Dodge funny car kit while the rear deep dished chrome reversed wheels came from a Johan '69 Road Runner kit. I also swapped the blower scoop and rear slicks for something better looking from my parts box. 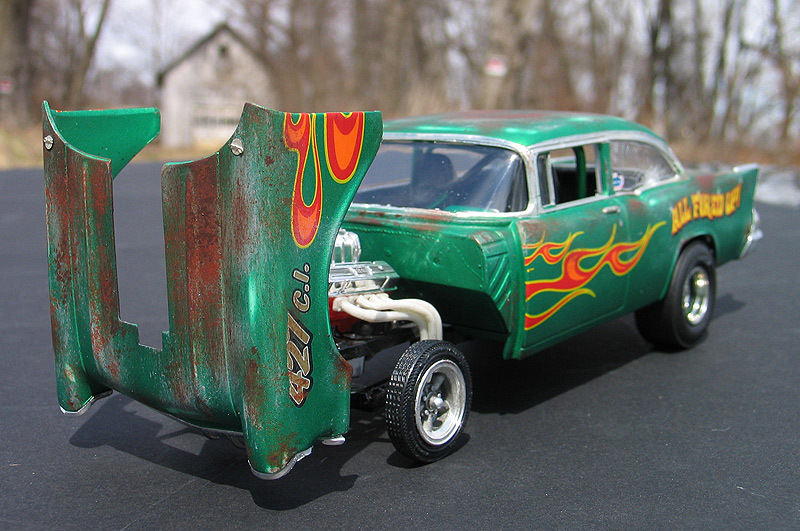 To complete my vintage gasser, I cut the upper grill molding away from the grill and attached it to the hood. I also added a Moon gas tank from my parts box and scratch built a mount for it. Lastly, I added a set of photo-etched hood pins from Pro-Tech. I usually photograph my models in a studio, but I thought it might be fun to shoot some outside with a barn in the background. I shot these in front an abandoned garage just a few miles from my home in Ohio. Check out Pro-Tech's web site.